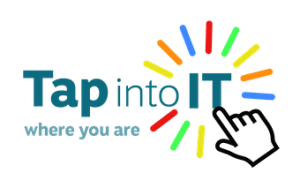 Tap into IT Where You Are provides 1:1 computer training and support services to people (usually over 65’s ) at home, in retirement or sheltered housing around Edinburgh. We aim to help all Edinburgh residents that are interested in our services. For more information on the services we provide keep reading. stay active and involved, healthier and happier as a result! Please feel free to contact us on behalf of friends and relatives. We can also help you choose a broadband provider, if requested. If you know of someone that may be interested, get in touch. We could go on! Along with the benefits of using a computer, come the frustrations too. We can assist “remotely” by connecting to your computer over the internet. Book a session and we will phone you at the pre-arranged time to guide you through the steps necessary for us to connect to your computer. It’s easy to use. We will guide you until connected. Thereafter, we’re sitting at your computer with you, “virtually” and can assist as necessary. We’ll show you what to do, where possible, rather than just provide a “quick fix”. So it’s learning as well as support. It’s effective and good value. We have supported a number of customers this way. If it turns out that we can’t help online and an actual visit is required, the remote support fee will be waived. Book a “remote support slot” and you could be back on track within 20 minutes or so. We are a social enterprise and aim to keep prices as low as possible. Our hourly charge out rate is £35 and the most common pricing packages are listed below. If you have any questions about our pricing structure, feel free to call us on 0131 228 5716 or 07505 555 011 for a no obligation chat. I never knew you could get so much information from a tablet. I have found it of great benefit being able to email my son in Australia. I feel more in contact with people because of this. Helpful space to work on emails and web. Assistance when needed. All in pleasant surroundings. The internet is great for shopping and you can get the supermarkets to deliver your weekly shop!